Father upset Colin Kaepernick article, quiz used in 5th grade daughter's class. Did a current events class reading assignment and quiz go too far? One father believes it was inappropriate and unprofessional. 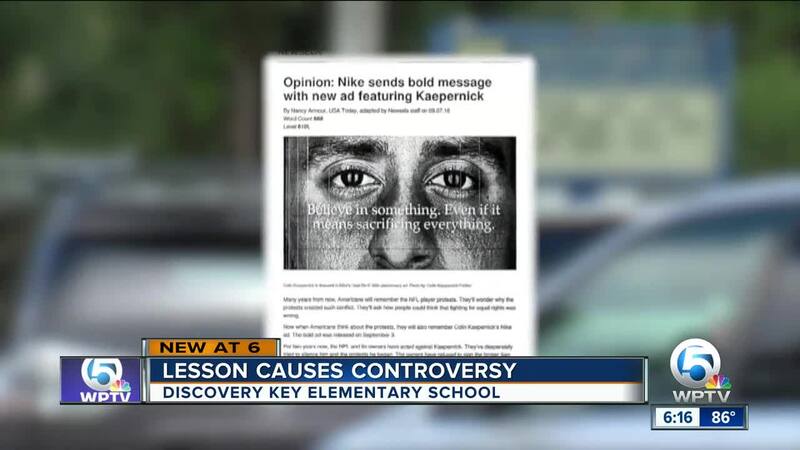 John Reed said his daughter was given an article by her fifth-grade teacher at Discovery Key Elementary in suburban Lake Worth that gave an opinion about Nike’s ad featuring Colin Kaepernick. Reed said the article was biased and claims the teacher interjected her personal opinion and a personal story he believes was inappropriate to share with fifth graders. On Tuesday Reed contacted the school principal and said he did not want his daughter being taught about the subject matter in class. He claims Wednesday she came home with more. This time, a questionnaire based on the reading of the article posted on Newsela. “I found it unprofessional. I read the article, and it seems very one-sided,” said Reed, who said his daughter researched Kaepernick after the reading in class and became upset when she learned there were more sides to the story. The Palm Beach County School District said the article and quiz were taken from a district-approved site called “Newsela” where teachers can pull current events for instruction. The article the district says was appropriate for fifth-grade level students. But, Reed disagrees. We asked the District if the teacher or principal of the school wanted to release information on why the article was chosen for the lesson, but they declined. Reed said his daughter was moved to another reading teacher’s class after he emailed the teacher and threatened to sue the teacher and the district. View the article and related quiz below.